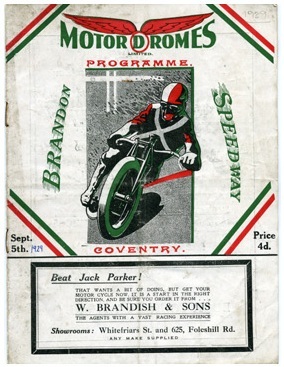 Speedway has taken place in at least 3 different venues across Coventry, with the first meeting taking place at Coventry Stadium as early as 1928. 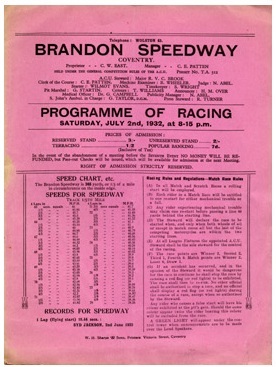 That first meeting took place on 21st July on a cinder dirt-track and was to be followed by a further 12 meetings in that first season. The final meeting at the stadium took place on 14th July 1930, although greyhound racing continued to take place at the circuit until 1964. 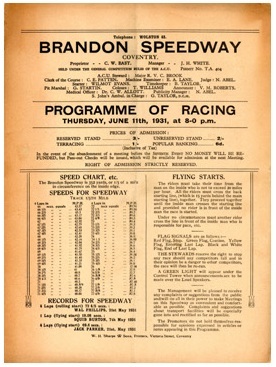 Just down the road at the Brandon Stadium speedway and greyhound racing operated, with the first speedway meeting taking place on 29th September 1928. 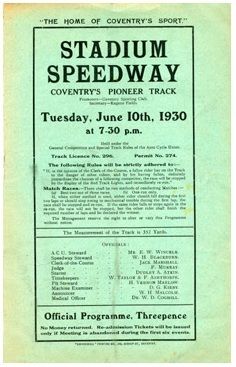 To this day the club plays a prominent role in British speedway. The team were Knockout Cup winners in 1967 and other notable successes include Premiership Champions in 1986 and Elite League winners in 2006. 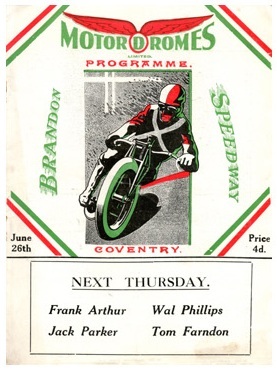 Greyhound racing has taken place on a number of different tracks within the Coventry area, initially in Lythalls Lane and more recently at Brandon, with the first meeting taking place on 7th Aprl 1928. 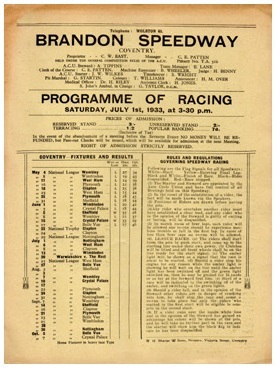 The most prestigious race of the year is the Eclipse Stakes which was first run in 1938 when it resulted in a dead heat between Demotic Mick (of Grehound Derby fame) and Catherine of Waterhall. Whilst the senior team has always been known as the Bees, the side which took part in the Conference were known as the Cougars. The Coventry Bees currently (2019) contest the National League. Recent successes include the Elite League Championship in 2005, 2007 and 2010 and the Elite League Pairs in 2008 and 2010.